In this interview segment, Hiroi-sensei describes his early experiences as a woodworker in Sendai selling kokeshi dolls before he settled on reviving his family’s tradition of making Edo-style tops. He discusses the difficulties his family had selling their goods, despite being discovered as the last surviving family in Japan that made Edo-style tops. This clip has been slightly edited from the original interview for clarity. A transcript of this clip can be found below. And a full transcript of our interview with Hiroi can be found here [forthcoming]. Hiroi Michiaki: Hmmm. Since I first came to Sendai… mmm… there were many [moments that stay in my mind], my father worked in many woodworkers’ shops, and was an artisan. And from that he became independent, and rented a house himself and of course put a lathe in it, and worked wholesaling and subcontracting kokeshi. And, ahh around this time kokeshi, souvenir kokeshi that is, they’re different from the traditional style of kokeshi [you see] now. He was able to sell a lot of those. There was a wholesale shop, and there he subcontracted unpainted objects called shirakiji (blank wood), and worked doing that. And doing that, he said that if he was to make kokeshi he might as well do traditional kokeshi, and he became a person named Wagatsuma-san’s apprentice, and came to [make kokeshi] from the Toogatta kokeshi tradition. And then they were able to sell traditional kokeshi, and it became a kokeshi boom, and they became able to sell them. He took his lathe to Tokyo and [sold them] at performances and department stores. 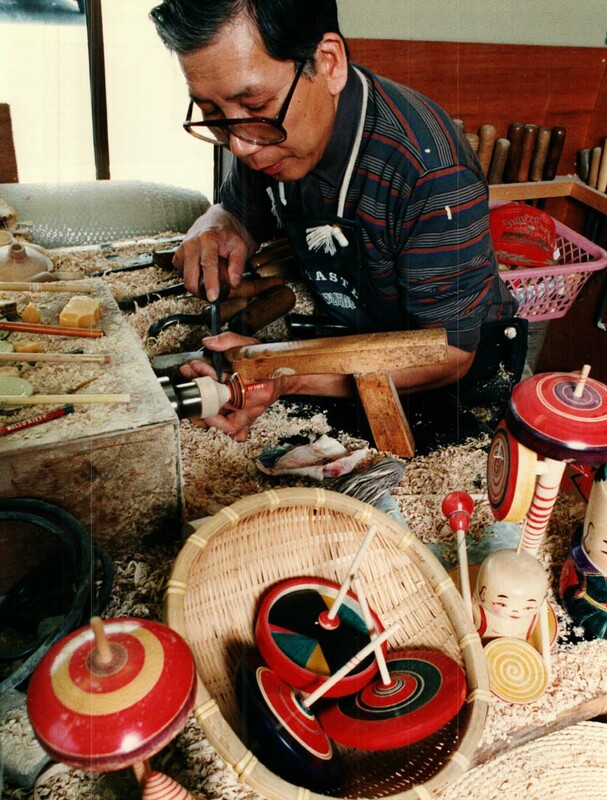 At first he did kokeshi, but kokeshi take a lot of time, so he did tops [instead]. 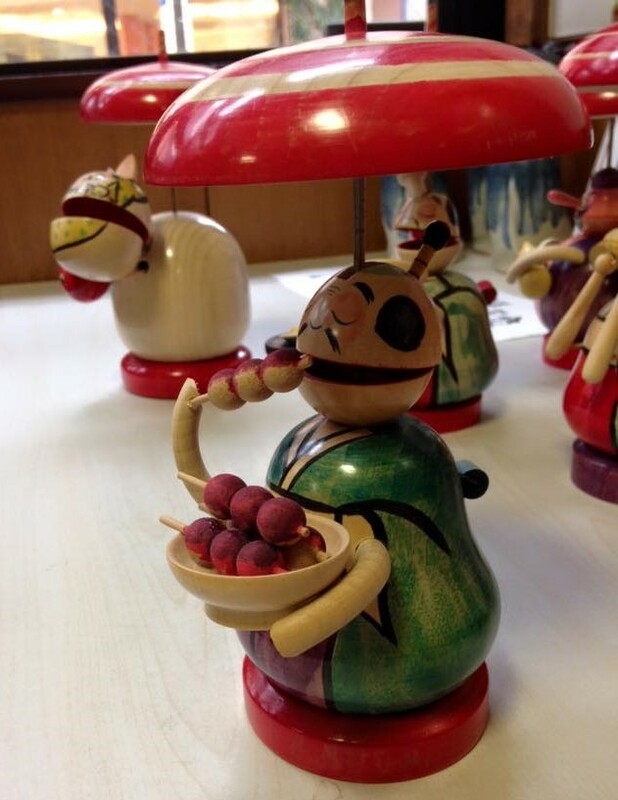 Hiroi: Then, in Tokyo, they said that along with Italy they were going to gather kokeshi. “Native toys” (kyōdō gangu) were [being gathered] here and there in Japan—if it’s Aizu, for example, they have the Akabeko (red cow). People came [here] that were collecting those kinds of native toys and kokeshi. Mmm I was doing tops, but at that time, since I was in Sendai I wasn’t doing Edo tops, but those called Sendai tops or Miyagi tops. Because they were [being sold] at goods shops in Sendai and Miyagi prefecture. And when I did that in Sendai [I made] Sendai tops, and when I was in Miyagi prefecture I did Miyagi ones, tops called Miyagi tops. And they were popular, since they were spinning right in front of you. The people who came to gather the native toys said something like “Where are you really from?” and I said “Actually I’m from Tokyo.” And they were like “Ahh of course!” They said, of course, we thought that in Tokyo, too, long ago there were lots of toys called “Edo tops (edogoma)” but no matter how much we looked, we couldn’t find them. When they said “Have you made them?” I said something like “My family has traditionally done them.” He said, “Ahh! I found them! 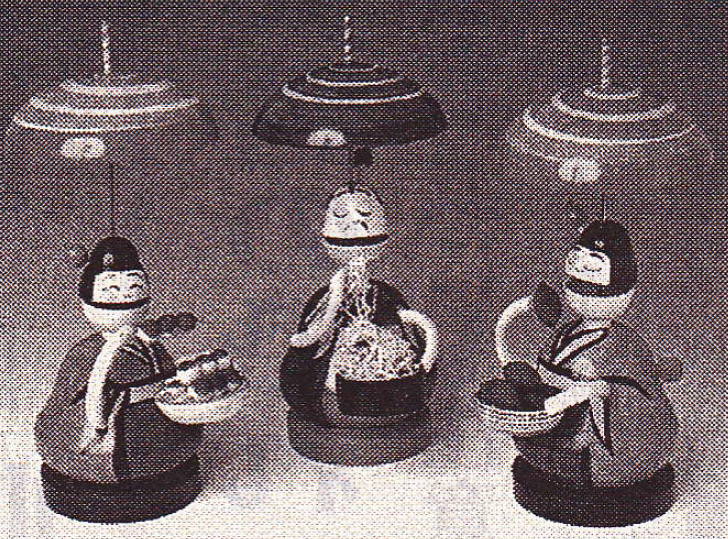 !” and there was a clamor about it in Tokyo, saying they finally found Edo tops. And my younger brother went to Tokyo. My brother got married in Tokyo and has done Edo tops there ever since. When he has a chance he makes Edo tops here in Sendai. Well, in Sendai, too, to a certain extent we made Edo tops, but people here didn’t understand about them, so even if we sold them they didn’t sell well. Paula: Did your family expect you to continue business as a top-maker? Hiroi: Mm, that was the only thing to do. Somehow I sold the tops. Like in the past, I thought I might not be able to eat, and in Sendai, just like back then, I wasn’t understood, and I couldn’t sell anything. And I went to Tokyo and it was a situation like I just described, and so I was able to sell my tops there. Though, at that time, rather than Edo tops I actually was working hardest at making the traditional kokeshi. Paula: When did you become an independent Edo top maker? Hiroi: Hmm… when was it? I don’t remember exactly. Mm… I didn’t really become aware of [when I started working independently, because] I was helping my father. And at some point I started using the lathe. So I don’t exactly what year, what month, what day–it wasn’t like that. Paula: About how many years were you an apprentice? Hiroi: Mmm, I don’t really know that either… It happens before you know it. At some point I was helping my father and working with my brother, and the three of us came to work together. What year, month, day–it wasn’t set. So I don’t really know how long [I was an apprentice]. Paula: This is a bit similar to the previous question, but when did you first come to Sendai? Hiroi: When I first came to Sendai… Shōwa–What year was it? Twenty-three. It must have been Shōwa 23 . Paula: What was your life like there? Hiroi: Mmm that time… we rented a room in someone’s house. Rented [just] a room. So how would [you say] we lived, I wonder? Somehow it’s weird to think of it as [properly] living there, but my father was working hard. And… at any rate we went back and forth all over within Sendai. We hadn’t been there long, so [we went] here and there. So even within Sendai we lived in a number of places… One, two, three, four, five, six, seven. We moved seven times. Paula: That was before you were married? Paula: And after you were married…? Hiroi: After I was married… umm… After I was married… Ahh. It was once or twice [that we moved]. To here. Umm… in Higashiguchi, Higashi… We got married at the town Higashi shichiban, and moved to Fukurobara, and here. It was twice [until] we were here. Paula: In Sendai, well, what sort of memories do you have of the various places [you lived]? Are there any that stand out? Hiroi: Mmm I have unpleasant memories, you know. (laughs) There were two places. Really terrible ones, two places where I was bullied, awful places I experienced. But after that, they were all enjoyable. Especially after I was independent. Umm… I had many friends, and it was nice that there were many people my age. It was really fun. In one place, for some reason in one place almost all of the kokeshi makers in Sendai gathered together, and I lived independently and felt like it was a neighborhood community, and there were lots of people doing the same work so it was nice. Even now looking back on it, it was a really a great time [in my life]. And that [time], the son of the sensei who taught kokeshi-making back then, he’s alive now, and even now he’s always saying “That was the best time, wasn’t it?” It was really great. On May 19th, 2014, we sat down with Hiroi Michiaki in Akiu, Miyagi prefecture, Japan, to begin our oral history interview. We began with Hiroi’s early life as a child in Tokyo. In this audio clip Hiroi describes his childhood days, family members, and the historical origins of the Hiroi family. Paula Curtis: Sensei, when and where were you born? Where are you from? PC: Which part of Tokyo? HM: Ah. In Tokyo, um, today it’s a place called Kōtō. PC: Could you talk a little bit about your life as a child and your family? 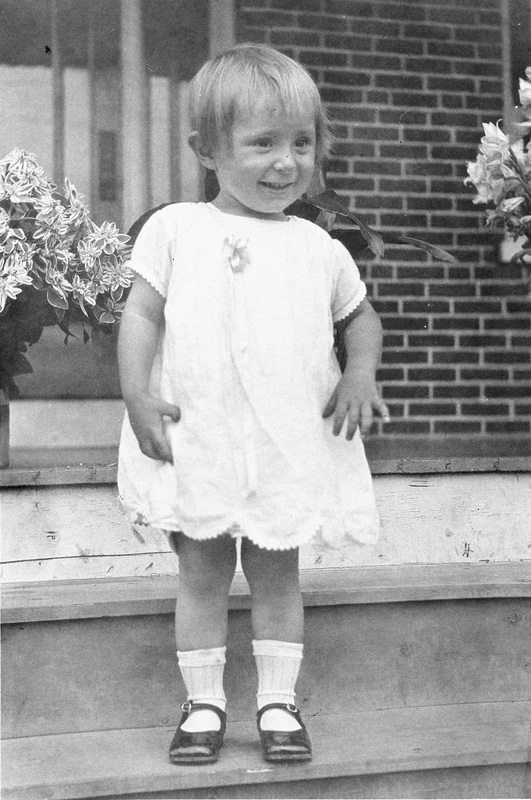 HM: Mm when I was a child. It was fun, when I was a child. Ha ha ha. PC: Could you explain a bit about your family’s history? HM: Ah, family. The Hiroi family? HM: The family of the Hiroi… Family… Well, if it’s family, I have parents and siblings, but… [do you mean] the history of the Hiroi? PC: Well, is okay [to talk about] both? HM: Well, my family was my father, my mother, and also I had two brothers and a younger sister. My mother and my sister,* in the war, they went missing in air raids. Even today their whereabouts are unknown. Right now my younger brother is in Yokohama, and my sister went to Osaka to get married, but she died, died of illness. Now, my younger brother is running around the world… In America… he’s an honorary citizen of Seattle, and it seems he has his own corners in museums in France and Germany. And also in Finland… it seems my younger brother has made it in museums and art museums. But I haven’t gone so I don’t know. PC: And the Hiroi family [line]? HM: The Hiroi family, it was something. Edo… err… it was the Sengoku period. Tokugawa Ieyasu’s Battle of Sekigahara… Tokugawa Ieyasu won, and when he moved to Edo, on the way from Sekigahara returning to Edo, the descendants of the Hiroi family… Mmm. I’ve forgotten where the place was, but in the old days there was a family called “Watanabe,” and they lived in a village called “Hiroi,” and there they were doctors. And Tokugawa Ieyasu won and returned to his castle, or I should say he was returning to Edo and on the way [Hiroi] made his acquaintance. I don’t know why he made his acquaintance, but [the Hiroi descendant] was invited to come with him to Edo, and it’s said that because he was from that Hiroi village he was called Hiroi and not Watanabe. And he was employed by Tokugawa Ieyasu’s grandson… was it Iemitsu? And for generations he was, what should I call him, the private doctor of the bakufu, in the private residence, he held the highest rank of a doctor. That’s the story. There’s a book published, but, shall I show you the book? PC: Ahh, that’s right. Is it alright to look at it later? PC: Okay. Thank you very much. HM: Umm records… there’s a book of them. It’s the Kan’ei or Kansei period… a reference book. In there [the history] of my family is written. Yeah. PC: Well then, about your family now—are you married? Do you have children? HM: I’m married, but for some reason we couldn’t have children. Mm. HM: School, hm… We were dragged into the war, so I didn’t go properly. HM: Umm. The last [school I went to was] Ooshima daini elementary school, wasn’t it. Before that… in Yonezawa there were mass evacuations and school evacuations, so I was in Yonezawa for half a year. I think it was half a year. And I returned to Tokyo and at that time when I returned immediately there were air raids, and families were scattered, and people across the country and walked about from place to place, and I couldn’t go to school properly. Mm. PC: Well, when you were in school, did you have a course or subject you were particularly interested in? HM: Ahh, I hated studying. Ha ha ha. I only liked gym. PC: Well, work, about work, before you became an Edo-style top artisan, what kind of work had you done? HM: Ahh… come to think of it, I did a lot of different kinds, but not for long. What did I do? I did many things. That is, rather than “doing” them, it’s better to say I helped. I worked but I didn’t receive any money. PC: Was there, umm, a work that you particularly liked to do? You did a lot, but was there one you really liked? HM: Ahh, in the end the work my family was doing was the best. I didn’t really have another that I liked. Mm. 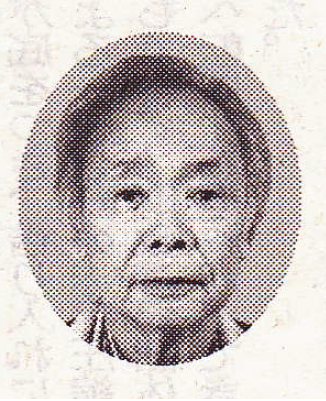 Photograph of Monzen-nakacho, in 1935 from the”Archives for the Tokyo downtown area 100 years” published by Life Information Center and is under public domain license, retrieved from Wikimedia Commons.